If you use Google Chrome as your default web browser and find yourself with a ton of tabs and windows open on a regular basis, you likely know the RAM, swap, and resource burden that leaving a gazillion tabs open does to your computer. 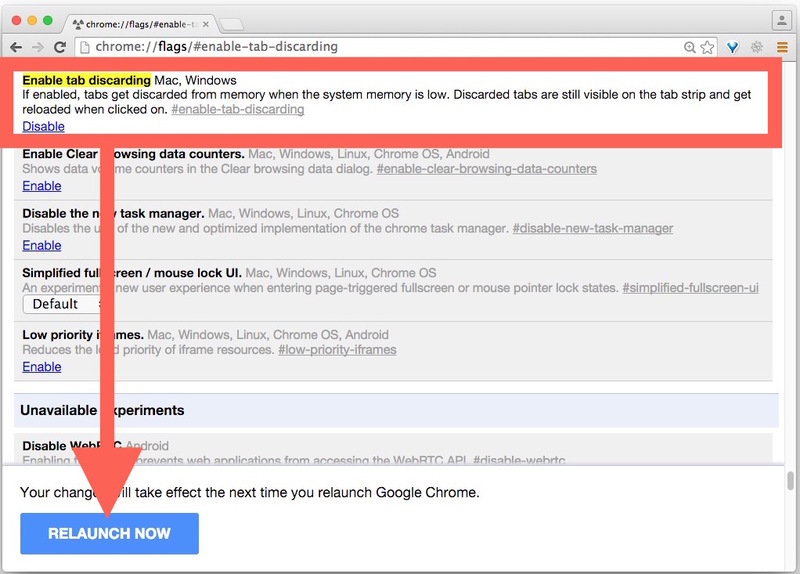 Rather than forcibly quitting Chrome or abandoning your browser tabs, the latest versions of the Chrome browser support an optional “discarding” feature that will automatically discard background tabs as the application begins to run low on available memory. If you don’t have this available it likely means you haven’t updated Chrome sometime in the past few hundred years, so updating the app will reveal the discarding tabs feature. For example, I currently have 77 tabs open in Google Chrome, causing Chrome to consume 16GB of memory and forcing the application to use virtual memory. But with Tab Discarding enabled, Chrome tosses out most of those tabs from memory and reduces the memory usage footprint in half, while preventing the app from having to use swap to store tabs that aren’t even in active use. The feature is described in the Chrome Flags menu as follows: “If enabled, tabs get discarded from memory when the system memory is low. Discarded tabs are still visible on the tab strip and get reloaded when clicked on” and it absolutely works as described. Whether or not this is beneficial to you as a user will likely depend on if you use Chrome as your default browser, if you’re a tab hoarder (guilty! 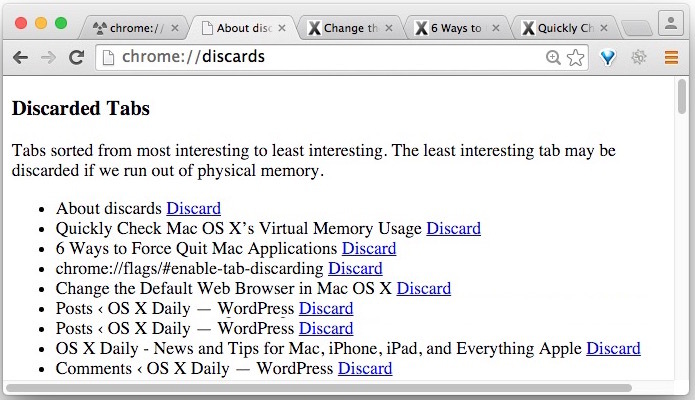 ), and if you encounter memory issues with having a million tabs open at once. You can always turn this feature back off again by returning to the chrome://flags/#enable-tab-discarding section of flags and choosing “Disable”. Chrome is a really powerful web browser app with a ton of advanced features that are hidden from the standard user, if you want to learn more about some of them, don’t miss our many other Chrome browser tips, they usually work for Chrome on any platform, whether iOS, Mac OS X, Windows, or Linux. I don’t use Chrome hardly ever, but this is a cool feature. Would be nice if Safari had a similar set of technical features I could screw with. …granted, Windows, OS X and Linux computers (not mobile devices) would hopefully have enough memory to really minimize this from being triggered. It’s great that it’s switchable. Can you define more precisely ” with a ton of tabs”? Enough tabs to consume all of your available memory is probably a good definition of that. How is this different to the Great Suspender? That also allows whitelisting and to prevent discarding temporarily, on a per-tab basis. The main problem with Great Suspender, like all other Chrome extensions, is that those extensions can read, access, and alter any and all data on every webpage you visit in Chrome. It specifically asks you to confirm this is OK when you ‘install’ the extension, read the dialogs! Do you trust some random developer from who knows where with who knows what agenda with that power? You look at your bank account, and whatever dinky extension you installed, can look at it too, if they want to. You enter a password onto a web page, you read your email, you look at certain websites, it’s all for the taking for the browser extensions. No thanks. I wouldn’t install a single extension into a browser, they are not secure at all. Could all be junkware for all we know, nobody checks! I’ve got 16GB of RAM on my Macbook and lots free but it keeps discarding tabs and I loose my place “chrome://flags” and disabling the feature does nothing. Still discards open tabs.